You will be happy to find out about the luxury options you have when you are searching for a Naples Florida hotel that is perfect for families. If you are looking for premium service with a private beach area and unique activities for children then The Ritz-Carlton Naples is superb. 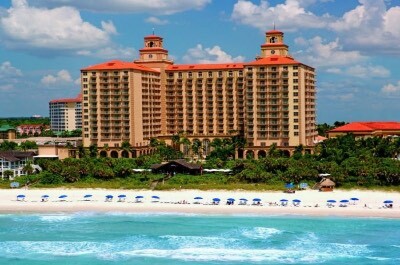 The Naples Grand Beach Resort is ideal for families that want affordable luxury. The Naples Beach Hotel and Golf Club as well as the La Playa Beach and Golf Resort offer a children’s club with adult activities like an 18-hole championship golf course onsite. 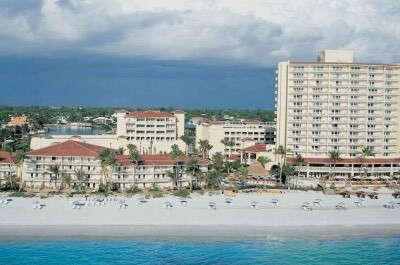 For families that want an all-suite atmosphere that does not lack amenities then the Edgewater Beach Hotel is great. If you are seeking to find a true luxury Naples Florida hotel that is perfect for families with numerous onsite amenities and sports a private beach then the Ritz-Carlton Naples is a superb choice. Located next to Vanderbilt Beach in the Naples Park area, the Ritz-Carlton Naples is directly on a white sand beach overlooking the Gulf of Mexico and is less than 1.5-miles to Delnor-Wiggins Pass State Park. The Ritz-Carlton Naples has a modern fourteen floor architectural style with Spanish Moorish accents that contains 450 rooms and suites that offer an elegant contemporary decor. Rooms and suites are available with Club Level Access which includes a lounge where you will find complimentary breakfast, lunch and evening appetizers with libations as well as dedicated concierge services. Rooms are spacious at 434 square feet with a choice of bedding and a private balcony that offers views of the coastline, beach and Gulf of Mexico (limited view rooms do not have a balcony). Large beachfront and coastal view room are between 508 to 532 square feet with two queen size beds and a private balcony with views of the coastline or beachfront. One-bedroom Beachfront and Terrace suites range in size from 680 to 816 square feet with a separate living room, 1.5-bathrooms and views of the beach or Gulf of Mexico from a private balcony. Three-bedroom suites have 1,768 square feet with a separate living room, dining room, 3-bathrooms and four balconies with pool as well as gulf views. 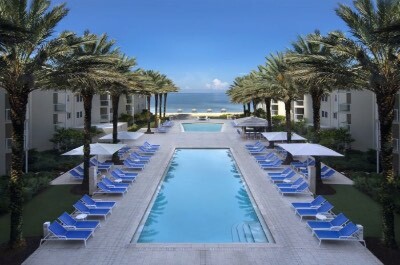 The Ritz-Carlton Naples has a perfect private white sand beach where you will find plenty of water sports equipment and cabanas to rent for the day. The Ritz-Carlton Naples has numerous onsite amenities that include tennis courts, an aquatic education center, access to two 18-hole championship golf courses, full service spa, fitness center and children will be thrilled the various activities available at the kid’s club. There are also four swimming pools which include two saltwater pools that are designated as adults only and there is a family pool with a splash pad for kids. Dining at the Ritz-Carlton Naples includes all three meals at Terrazza; =H2O+ serves breakfast as well as lunch; the Gourmet Shop has light snacks for all three meals and the Poolside Cafe prepares lunch. Dinner choices include Bites, Gumbo Limbo; Dusk and the Grill prepares steaks. Nightlife is quiet onsite with sunset drinks at Gumbo Limbo and Terrazza. When you want to find a family-friendly luxury Naples Florida hotel that offers great amenities onsite, is good for all types of travelers including families and boasts easy beach access then the Naples Grande Beach Resort is ideal. Located in the Clam Pass Park area overlooking Outer Clam Bay along Seagate Drive, the Naples Grande Beach Resort is situated within 23-acres of manicured gardens as well as mangrove forests and is 0.5-miles to the Baker Museum. 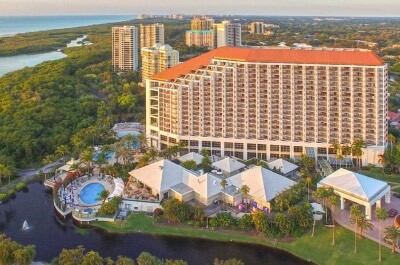 The Naples Grande Beach Resort has a unique modern eighteen story architectural design with 424 rooms and suites as well as 50 garden villa cottages that sport a chic modern interior. Rooms are 465 square feet with a choice of bedding and a private balcony that boasts views of the gardens, resort, city skyline or Gulf of Mexico (some rooms have two balconies). Garden Villas have 700 square feet with a separate living room and two balconies that offer views of the gardens, pool, or tennis area. One-bedroom Gulf and Signature view suites have between 1,130 to 1,155 square feet with a separate living room, 1.5-bathrooms and private balcony that has views of the gulf. Grande Suites have 2,000 square feet with a separate living room, Jacuzzi, kitchenette, dining room and private balcony that boasts top floor views of the gulf. The Naples Grande Beach Resort is a short walk to the beach where you will find beach and watersport equipment rentals as well as plenty of room to relax. The Naples Grande Beach Resort is within a short distance to several attractions such as the Holocaust Museum and Education Center of Southwest Florida, the Conservancy of Southwest Florida and the Village Shops on Venetian Bay. The resort offers numerous onsite amenities that start with three freshwater swimming pools that include a family pool with waterslides, an adult’s pool and lap pool. You will also enjoy numerous tennis courts, an 18-hole golf course, arcade room, fitness center and a full service spa. Dining at the resort includes the Catch of the Pelican and Aura Restaurant for all three meals, lunch and dinner at Rhode’s and there is the Oasis Pool Bar for light fare. Nightlife onsite includes drinks on the sunset Veranda around a fire pit or you can catch a live performance at the Artis-Naples concert venue. If you are looking for a luxury Naples Florida hotel that offers numerous resort-style amenities, has easy beach access and is perfect for all types of travelers including families then the Naples Beach Hotel and Golf Club is superb. Located along Gulf Shore Boulevard North just south of Lowdermilk Park, the Naples Beach Hotel ad Golf Club is situated on 125-acres of manicured gardens directly on the beach and is a mere 2.5-miles to the Naples Pier. The Naples Beach Hotel and Golf Club has a modern nine floor architectural style with 319 rooms and suites that feature a modern beach decor. There are five categories of rooms which include Cabana, Florida, Tower, Watkins and Patio rooms that feature various floorplans. All rooms have a choice of bedding and a private balcony/patio that boasts views of the resort or Gulf of Mexico. There are five styles of one-bedroom suites in each area with the largest suites being the Cabana suites which have two living rooms and the Watkins suites have two balconies as well as 1.5-bathrooms. Each suite offers a separate living room and private balcony with resort or gulf views. The Penthouse suite boasts incredible views from a private balcony. 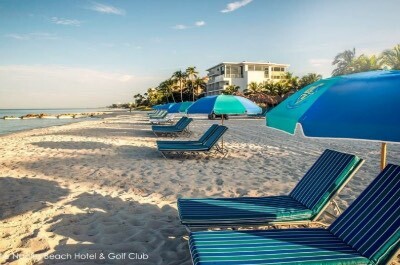 The Naples Beach Hotel and Golf Club offers easy beach access where you will find beach and watersport equipment rentals with plenty of space to lounge as well as beachside drink service. The Naples Beach Hotel and Golf Club is nearby to several attractions such as Cambier Park, Naples Historical Society’s Historic Palm Cottage and shopping at Fifth Avenue South. There are two freshwater swimming pools that overlook the gulf with drink and food service. The property boasts a number of amenities for adults including an 18-hole golf course, tennis courts, an orchid house with 3,000 plants and a full service spa as well as a kid’s club with organized events for children. Dining onsite includes four restaurants which are Broadwell’s for breakfast; Poolside offers lunch; the Sunset Beach Bar and Grill serves lunch as well as dinner and HB’s on the Gulf serves beachside for lunch and dinner. Nightlife onsite includes live entertainment every evening or you can venture to the Gulfshore Playhouse for a live performance as well as a cold libation at Shane’s Cabana Bar. When you are searching for a family-friendly luxury Naples Florida hotel that offers all-suite accommodations and perfect beach access then you should stay at the Edgewater Beach Hotel. Located along Gulf Shore Boulevard North in the Lowdermilk Park area, the Edgewater Beach Hotel is situated directly on a white sand beach overlooking the Gulf of Mexico and is less than 1.5-miles to the Naples Zoo at Caribbean Gardens. The Edgewater Beach Hotel has a modern seven story architectural design with 125 all-suite units that boast a modern chic interior. One-bedroom Naples view suites are 700 square feet with a separate living room, kitchenette (microwave and refrigerator) and a private balcony that has views of the city skyline. One-bedroom Gulf view suites have 700 square feet with a separate living room, full kitchen and private balcony/patio that offers gulf/pool views. One and two-bedroom Beachfront suites are sized between 700 to 1,100 square feet with a separate living room, a kitchen, floor to ceiling windows and a private balcony with beachfront views. Two-bedroom Premium suites are 2,000 square feet with a separate living room, dining area, kitchen, 2.5-bathrooms and a private balcony with gulf views. The Edgewater Beach Hotel is ideally situated along the white sand beach with beach and watersport equipment for rent onsite. The property is close to many attractions such as Fifth Avenue South for shopping, the Revs Institute and the Naples Depot Museum. The Edgewater Beach Hotel has two freshwater swimming pools with a sundeck and pool bar as well as a fitness center onsite. Dining at the hotel includes the Coast Restaurant which serves all three meals and the Pool Bar has light snacks. Dining offsite within a short distance includes Jimmy P’s Charred for steaks, Fuse Global Cuisine and USS Nemo prepares seafood. Nightlife includes a sunset drink at the Pool Bar or you can venture offsite for a craft beer at the Rip Tide Brewing Company. When you are interested in luxury Naples Florida hotel that boasts a laid-back atmosphere, has great beach access and has numerous onsite amenities then you should try the La Playa Beach and Golf Resort, a Noble House Resort. Located west of the Naples Park area along Gulf Shore Drive, the La Playa Beach and Golf Resort, a Noble House Resort is situated on the beach overlooking the Gulf of Mexico as well as Vanderbilt Bay and is less than 1-mile from the Delnor-Wiggins Pass State Park. The La Playa Beach and Golf Resort, a Noble House Resort is a collection of low and high rise buildings with a modern architectural style that contain 189 rooms as well as suites which feature a renovated contemporary Mediterranean decor. Bay Tower rooms are 600 square feet with a choice of bedding, floor to ceiling windows and a private balcony that offers a resort or Vanderbilt Bay view. Pool view rooms have 450 square feet with a choice of bedding, floor to ceiling windows and private balcony that features a garden/pool view. Beachfront and Beachfront Premium rooms are spacious with a choice of bedding, floor to ceiling windows and a private balcony with Gulf of Mexico views. Beach House Lanai rooms are 450 square feet with a choice of bedding, floor to ceiling windows and a private balcony that has beachfront views. One-bedroom Beachfront suites have 850 square feet with a separate living room, floor to ceiling windows and private balcony overlooking the beachfront. The La Playa Beach and Golf Resort, a Noble House Resort has a great spot on the white sand beach with watersport equipment available onsite for rent and beach equipment is complimentary. The property is an easy drive to attractions such as the Barefoot Beach Preserve, Clam Pass Park and the Naples Zoo at Caribbean Gardens. You also enjoy preferred tee times at the La Playa Golf Club and children will be thrilled with daily activities at two different kid’s club. The La Playa Beach and Golf Resort, a Noble House Resort has four freshwater swimming pools with butler drink service, a fitness center and a full service spa. Dining at the property includes the Baleen Restaurant for all three meals and there is light fare at the Tiki Bar poolside. Nightlife includes drinks by the beach fire pits while you watch the sunset.